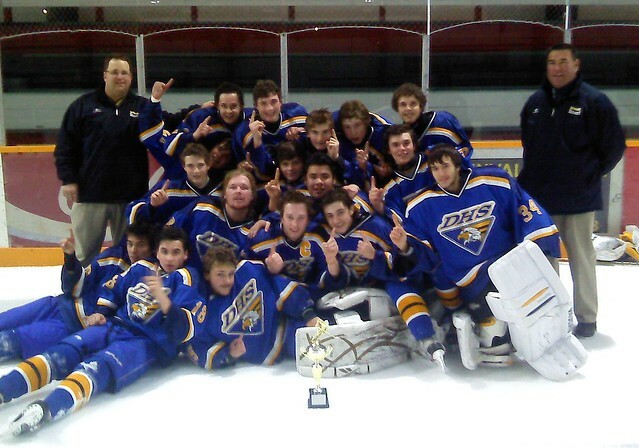 The DHS Eagles Boys Hockey team had a successful weekend, winning the 2011 Morden Boys HS Hockey Tournament. Game #3 defeated Fort Frances 5-4 in another shootout. The Eagles came from behind in the third period. The boys were down by a 4-2 score until Carney McConnachie and Ryan Hron tallied late in the 3rd to tie the game. The 4 on 4, 5min OT period solved nothing, and there was no scoring in the shootout until the 4th round when Kale Kuzemchuk added to his 2 goals by scoring a beauty. Justin Oltsher closed the door as he stopped all 4 FF shooters he faced. Thanks, article has been corrected.